We are so excited that TechData chose Evolving Solutions as a feature for their partnership video series. The video debuted at the TechData Summit in Phoenix, AZ yesterday. Our team had a blast telling the story of the special relationship we share and explain why it is so valuable for our clients. In last week’s blog post, we walked through what’s new with VMware’s VSAN 6.0. Today, let’s take a look at how its management and performance. Witness components—those that contain only object metadata—are part of every storage object. A witness serves as a tiebreaker, to avoid split-brain behavior when availability decisions are made in the Virtual SAN cluster. Each Virtual SAN witness component also consumes 2MB of capacity. Virtual SAN All-Flash architecture – Virtual SAN 6.0 allows the ability to create an all-flash architecture in which SSDs are used for caching as well as data persistence. In this architecture, the flash cache is used completely for write caching. This all-flash architecture allows tiering of SSDs: a write-intensive, high endurance caching tier for the writes and a read-intensive, cost-effective SSD tier for data persistence, thereby reducing the cost of the all-flash architecture. Virtual SAN All-Flash provides consistent, predictable performance with up to 90K IOPS/Host and sub-millisecond response times, making it ideal for tier-1 workloads or any applications that require consistent, predictable response times. Virtual SAN integrates with the entire VMware stack, including features like vMotion, HA, DRS etc. Virtual SAN can leverage VMware vSphere Data Protection™, and vSphere Replication™ for data protection, backup, replication, and disaster-recovery (DR) purposes. Virtual SAN interoperates with vRealize Automation and can be deployed in conjunction with VMware Horizon® View™ in VDI environments and vCenter Site Recovery Manager in DR environments. VMware’s Storage Policy Based Management framework allows you to define storage requirements on a per-VM basis, based on the needs of the applications running in the VMs. VSAN then matches those defined requirements to underlying storage infrastructure. This simplifies storage management…. And as you will see, saves you time and money. Rack Awareness is a new feature in VSAN 6 – Virtual SAN 6 now enables intelligent placement of virtual machine objects across server racks for enhanced application availability even in case of complete rack failures. Of course, VSAN can also tolerate disk, host, and network failures (like before in VSAN 5.5). Eliminates need to make large upfront investments and gives you linear predictability for forecasting. Virtual SAN 6.0 doubles the scalability of Virtual SAN 5.5 by scaling up to 64 nodes per cluster for both hybrid and all-flash configurations. Furthermore, Virtual SAN 6.0 improves VMs per host by more than 50% with the ability to manage up to 150 VMs/host on a hybrid configuration and 200 VMs/host in an all-flash configuration. In addition to providing enterprise-level scale improvements, VSAN 6.0 provides extremely high and consistent performance. In hybrid architecture, VSAN can provide up to 40K IOPS/host, reflecting a 2x improvement over the first release of VSAN. All-Flash architecture is specially designed to provide high performance with predictably low latencies. It can provide up to 90K IOPS/host. High VM density in VDI environments. VSAN is high performance, scalable and resilient. Virtual SAN is VMware’s software-defined storage solution, built from the ground up for vSphere virtual machines. It abstracts and aggregates locally attached disks in a vSphere cluster to create a storage solution that can be provisioned and managed from vCenter and the vSphere Web Client. VSAN is hypervisor-converged – that is – storage and compute for VMs are delivered from the same x86 server platform running the hypervisor. It integrates with the entire VMware stack, including features like vMotion, HA, DRS, etc. VM storage provisioning and day-to-day management of storage SLAs can be all be controlled through VM-level policies that can be set and modified on-the-fly. VSAN delivers enterprise-class features, scale and performance, making it the ideal storage platform for VMs. 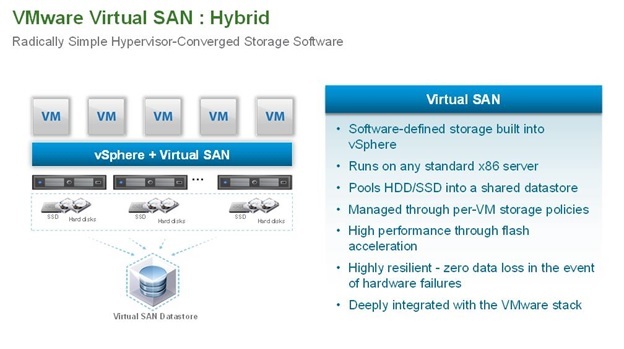 Virtual SAN enables both hybrid and all-flash architectures. Irrespective of the architecture, there is a flash-based caching tier which can be configured out of flash devices like SSDs, PCIe cards, Ultra DIMMs etc. The flash caching tier acts as the read cache/write buffer that dramatically improves the performance of storage operations. In the hybrid architecture, server-attached magnetic disks are pooled to create a distributed shared datastore, which persists the data. In this type of architecture, you can get up to 30K IOPs per ESXi host. In All-Flash architecture, the flash-based caching tier is intelligently used as a write-buffer only, while another set of SSDs forms the persistence tier to store data. Since this architecture utilizes only flash devices, it delivers extremely high IOPs of up to 90K per ESXi host, with predictable low latencies. Hyperconverged storage solutions require the installation of a virtual storage appliance on each host. However, in the case of VSAN, because it is embedded in the ESXi kernel, all the Virtual SAN smarts are already built in to the hypervisor and there are no additional components to install. Just 2 clicks and it can be enabled. There is no separate virtual appliance and no additional management overheads. Because it is embedded in the hypervisor VSAN provides the shortest path for I/O, making storage operations optimally efficient and does not consume CPU resources unnecessarily. Even during maintenance operations and VM migrations, storage operations are seamlessly handled. What’s New in VSAN 6.0? Virtual SAN 6.0 is the second-generation of VMware’s hypervisor-converged storage for VMs. Virtual SAN 6.0 capabilities are centered on delivering high performance and increased scale without compromising simplicity and cost-effectiveness. With the major enhancements of this release, Virtual SAN provides both enterprise-class scale and performance as well as new capabilities that broaden the applicability of the now proven Virtual SAN technology to business critical environments. VSAN is built from the ground up for the vSphere virtual infrastructure. With its simplicity, performance, scalability and cost-savings, VSAN is suited to be the storage for all your VMs. VSAN is now enterprise-ready and customers can use it for a broad range of use cases, including business-critical and tier-1 production applications. It is embedded in the VM kernel and does not need to be installed like a storage appliance. Just 2 clicks and its enabled! It uses storage policies to assign storage services to specific VMs. It then automatically tunes and rebalances storage to ensure that the VM storage SLAs stay compliant with the policies throughout the lifecycle of the VM. It is managed through the same web interface as the rest of your vSphere environment. This makes it easy for even the VI Admin to manage storage and eliminates the need for specialized skillsets. It is completed integrated into VMware stack, and works seamlessly with other vSphere features and VMware products. Check out this post: A Closer Look: VSAN Architecture where Brian examines the management and performance of VSAN architecture.